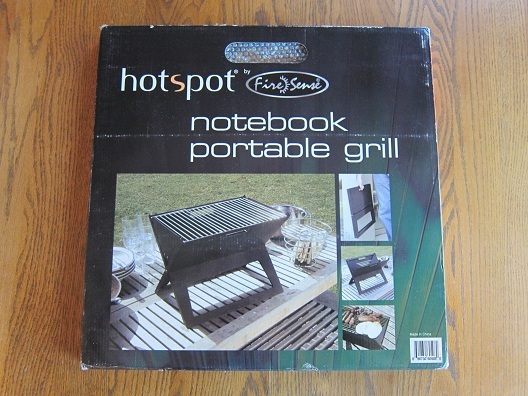 For this week’s review I was sent the HotSpot Notebook Charcoal Grill from Kyle Kromidas at Well Traveled Living. Well Traveled Living is a designer, importer and distributor of outdoor living products. The company was established in 1998. The HotSpot Notebook Charcoal Grill is a portable grill that is constructed of high heat resistant painted steel and is Made in China. 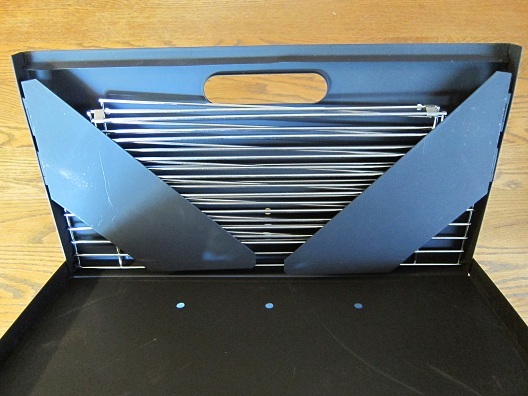 The grill stands at a height of 14.18 inches when fully assembled (Assembled Dimensions: 11.82” L x 17.53” W x 14.18” H, Weight 8.32 lbs) and folds down to 1 inch when not in use. This grill can be assembled in less than 30 seconds with no tools required. 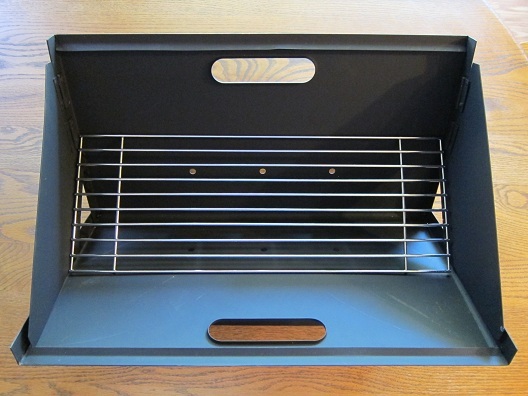 The HotSpot Notebook Charcoal Grill comes with a charcoal grate and a tri-fold cooking grate. 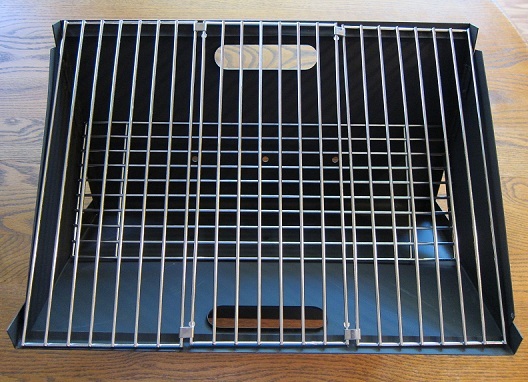 These grates sit inside the grill with the 2 foldable side panels up against them to hold them in place for when you fold the unit up when not in use. I pulled out both side panels and removed the grates. As you can see in the picture below the grill has a V-shape to it once that’s done. I placed in the charcoal grate and the tri-fold cooking grate after that. Once that was done it was time to do some grilling. Once I had the grill outside I filled it around 65% full with some Kingsford Charcoal (about half a chimney full). Then I lit the charcoal with my Looftlighter and placed in a couple cherry Mojobricks Baby Bar-B-Qubes as well. Once the charcoal was ashed over a little I placed on some asparagus I had marinated in a little lemon juice and Italian dressing. 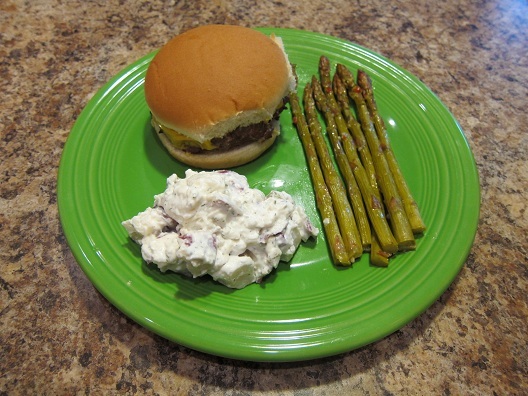 After a few minutes had passed I put on some burgers seasoned with a little Draper’s BBQ A.P. Rub (Love that rub!). The charcoal was burning pretty hot so it didn’t take long before the burgers were ready to flip. I also flipped over the foiled asparagus. 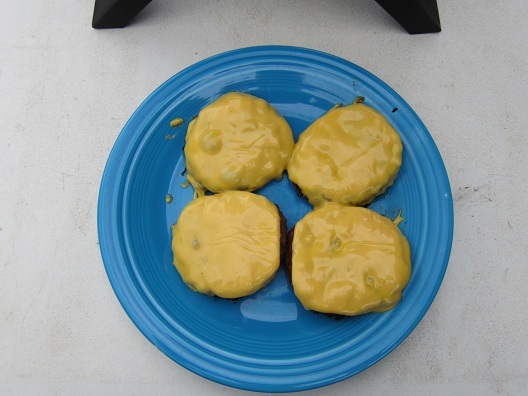 Once the burgers were pretty much finished cooking I placed some cheese on them. 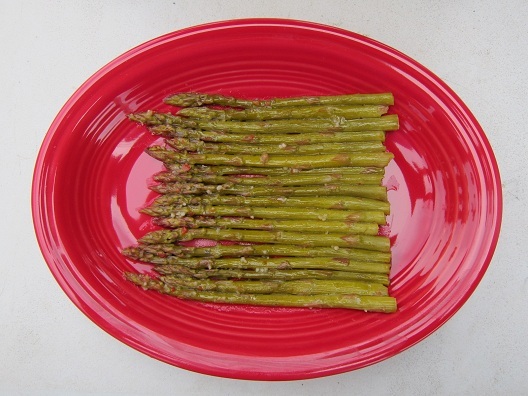 Then I removed the burgers and the asparagus from the grill to bring inside to eat. 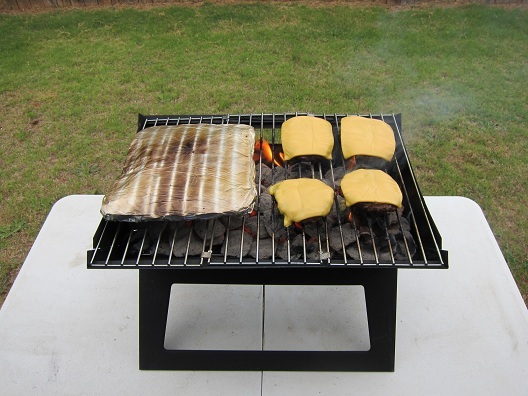 The HotSpot Notebook Charcoal Grill is a very easy grill to setup. To be very blunt and honest, that is pretty much all I liked about it. The grill feels very cheap and flimsy and doesn’t seem like it will hold up very well in the long run. Plus, I really didn’t like the hot ash falling out the little holes on both sides of it. It made quite a mess and I worried about the hot ash falling onto our very dry grass in our backyard and starting a grass fire. This grill gets very hot to the touch, so be sure to keep kids away from it. It’s also not safe to move once it’s in use. The HotSpot Notebook Charcoal Grill has no lid since it’s a hibachi-style grill, so it takes a while for the coals to burn out when you’re done using it. I personally do not recommend this grill for use in a backyard setting, but for those that may be interested, you can find it here . For more information on the HotSpot Notebook Charcoal Grill please visit their Website. I think your review is missing the whole context of why someone would consider buying/using a grill of this type. How many grills do you own that will fold completely flat? That may not be important to someone looking for a grill for their normal backyard grilling but if you are looking for a grill that takes minimal room on your bike or in the trunk of your Miata for occasional picnic use this type of design makes a lot of practical sense. 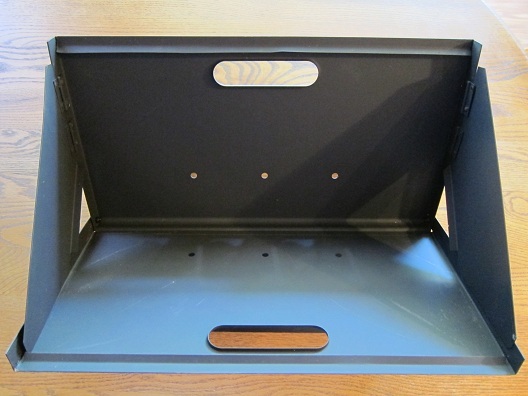 Often, items may have seemingly flimsy individual components but when assembled form a rigid stable unit. While it may have felt flimsy how stable did it feel when it was assembled and in use? When you were flipping burgers did if feel as if it was on the brink of being pushed over? 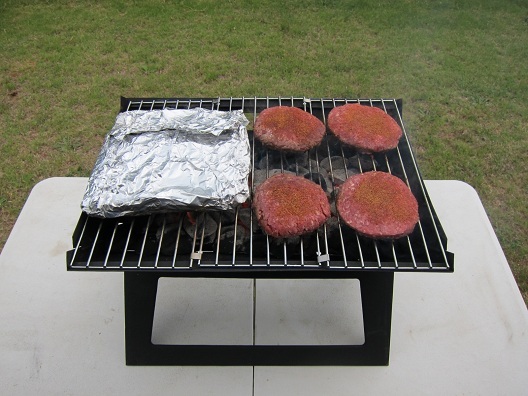 Wow a grill that gets hot to the touch when it is in use – unheard of!! 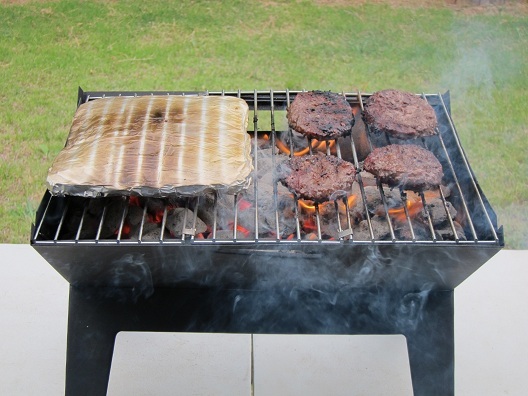 I can see that there may be some advantage to having handles that may remain cool enough to move a grill when in use. However, in the thousands of times I have grilled I can count on one hand the number of times I have moved a grill while in use. If being used on a picnic on the beach or in a meadow how many folks are likely to be concerned that some ash falls thru the little holes in the bottom? My guess is that number is pretty close to zero. If setup on a picnic table I can see that the ash may be a bit of a nuisance but a piece of foil could easily be rigged as a catch basin. No lid?!?!?! Seriously??? 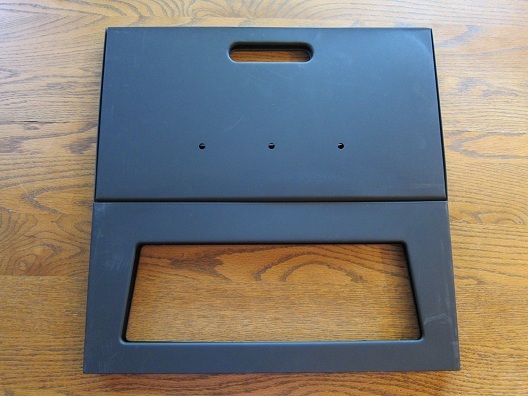 Your going to knock what is essentially a folding hibachi type grill for not having a lid?? Looking at the vendor website I see that there is no pricing info. For any of their products. What’s up with that? So, both your review and the vendor website I grade them an F.
Thanks for your comment HeavyG! Sorry you didnt like the review, hopefully you found it helpful anyway, but I can only call it like I see it. I’m a backyard griller and I based my review on using it in my backyard. Everyone has there own opinion when it comes to products and this was mine. Thank you again for leaving a comment and be sure to come back and let me know you thoughts on this grill after you get a chance to actually use it. Certainly you are entitled to your opinion. No argument there. Perhaps the mistake was on my part. I guess that I should not have just assumed that a review of a folding portable grill would be written with that use and perspective in mind. My bad. I didn’t mean to be just a cranky negative complainer so let me add what I should have said in my original comment: The photos were useful in showing how it is setup. So thanks for that. I can see the perspective that Jay is using in his review. For portability and ease of transportation, this may be a good unit (especially for camping or the beach). However, this unit could be used by someone in an upstairs apartment complex (or somewhere with not enough room for the footprint of a fuller sized grill). Cleanup and portability is a big plus, in that case. Jay, do you think this unit would be okay in a camping or beach scenario? This grill might be better for use on a beach or camping. I will make sure to update my review if I get the chance to use this grill in either of those settings. As I mentioned above this review is based on my opinion of using the grill as a backyard griller. I am very proud of all the reviews I do and I am always honest about how I feel about a product. I’m not going to sugar coat my reviews just to make the company happy that sent me the product. I want people to know they can come to this site and see honest and fair reviews! Like I mentioned above…I personally do not recommend this grill for use in a backyard setting and I stand by my opinion on that! Glad you liked the review Wayne! Thanks again for leaving a comment! Great honest review Jay. The ash coming out of holes would be the killer for me. sounds dangerous. Keep up the good work. Thanks so much Ernie! Yeah, the hot ash coming out of the small holes on both sides was a big concern to me especially since the wind was blowing the hot ash all over the table I was using. 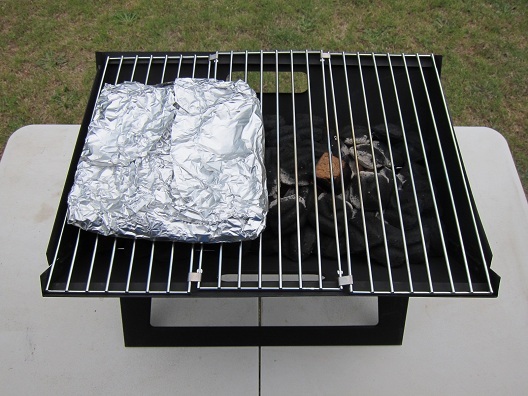 This might not be a big concern if you are using this grill at the beach, but in a backyard this could be a big issue and a potential fire hazard. This would be great to take to a tailgate where you don’t have a lot of space! Especially if you are at Commonwealth Stadium in Kentucky and those JERKS Louisville Cardinals are in town. Space is VERY limited and a flat grill would be handy to pack! Thanks for the info! Nice job on this review Jay. Thanks so much Brian…Glad you liked my review! Thanks for leaving a comment! I use this grill for kayaking/camping trips. The portability is a great benefit. Because of the short spurt of intense heat, I have been able to quickly make dinner for seven or more. Great for thick steaks (Marinating highly recommended due to closeness of coals to grill top)followed by veggies in butter wrapped in tin foil. Asperigus the best. Corn on the cob in foil. Mushrooms are quick and a nice treat. I’ve had several great experiences with this grill. Even my very picky father complimented his lake side burger on Independents Day, one of three compliments I’ve received from him in all of my 41 years; the others being my ability to fry a turkey as well as his grandmother and my choice to pursue a degree in advertising. Made ribs last night for practice. Best to put them on after initial burn has passed. Slathered in BBQ sauce and mummified in foil.